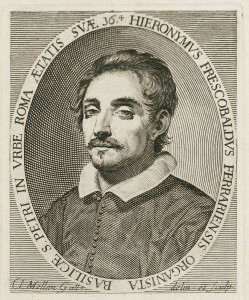 Girolamo Frescobaldi (1583-1643) became organist of the most important church in Christendom (the Basilica of St. Peter in the Vatican) at 25. It’s thus no surprise that he’s widely known today for his keyboard works. But he appears to us as an acomplished musician skilled in all genres through his vocal pieces (a mixture of avant-garde pieces in the new “recitar cantando” style and lighter arias) and his production for flexible instrumental ensembles (1-4 parts plus continuo). Featuring music from his collections of Toccate (1616, 1627), Arie musicali per cantarsi (1630), Canzoni (1628, 1634), Madrigali (1608). Voice (soprano), recorder, violin, dulcian and harpsichord.